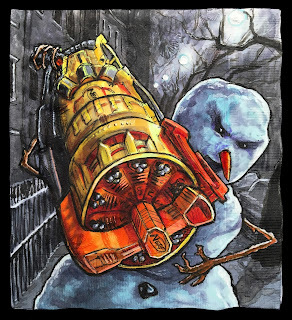 ...because snow goons appreciate excess. When my son suggested that I draw this particular weapon, he directed me to a couple of YouTube videos in which vloggers discuss a "leaked" snapshot of this not yet produced gun with the intensity and detail with which some might parse the Zapruder film or a grainy snapshot of Bigfoot. Foolish me. I have only recently become able to say, or type, the word "vlogger" with a straight face, and now I have to get my mind around the concept that there are adults who professionally discuss hypothetical Nerf merchandise at great length and in great detail. And there are tens of thousands of people who watch them. Previously, I had difficultly understanding why my sons, and thousands, if not millions, of other people wanted to endlessly watch a stranger play Minecraft on YouTube. My sons frequently expand my aging mind to accept new concepts.